Museum entry is by either free, on production of your FONFA Membership card, or via a donation for non-Members of a Minimum £7.50 for adults, £3 for 10 -16 year olds and free to ‘under 10s’. Pre-1961 Service Veterans are admitted free, on production of their Service ID. N.B. Please use the postcode BH23 8AU for SatNav insertion, which will take you to the Heatherstone Grange Estate entrance. DO NOT use the postal address to find us, in your car. A £10 donation entitles visitors to FONFA Membership for the current calendar year (an unlimited number of visits on Open Days throughout 2019), regular Members’ Newsletters and other events, if they wish to become a member. The Trustees and Fire Wardens (who are all unpaid volunteers), are happy to consider requests from groups of twelve or more adults, to arrange a bespoke visit to the Museum at your choice of date and time, by agreement. We will do their best to accommodate such requests, in addition to our normal Outreach Programme for visits by local school parties. If you represent a school or are a member of a group or represent a group of people who would like to arrange a visit to the Heritage Centre, during the winter months, please contact us, preferably well in advance, via the website e-mail address: fonfa2010@gmail.com , with details of your request. School parties are particularly welcome to visit, by arrangement. Teachers accompanying a school party are admitted free. N.B. Please be aware that we are required by law to have two trained Fire Warden Trustees on site, whenever members of the public are admitted. Just like to say how we thoroughly enjoyed our visit to the newly opened Exhibition Centre we visited on 31st July 2016. The staff were very helpful and knowledgeable and made us feel very welcome. The exhibition has been put together very well as is informative on all aspects regarding the airfields within the conurbation area during the World Wars. Will definitely visit again and will also put the word out on your behalf. Hi my Dad was stationed at Beau lie in 1944 in Bomber command I believe he was a medic and married a service lady(not my Mother) at the church st.John the baptist in Boldre. He died when I was 8 and I have only recently found his RAF service and history. I live in Australia and want to ensure our family knows his story so I am particularly interested any pictures around the time he may be on. The area and what you guys have done is amazing and extremely significant not only in Britain’s history but world history given the snuggle people faced then. Thank you and any tips I may follow would be appreciated. Many thanks for your contact and positive comments. I have replied to you via your e-mail address, with some guidance for your research. Looking forward to hearing from you with more information about your Dad. The info attached to the upstairs board only said in 49/50 Holmsley was returned to private ownership,There was no mention of the fact that in 1948 Holmsley accomodation blocks and nissen huts were used by Christchurch plus Ringwood and Fordingbridge Rural District Councils as social housing, The first person moved into the site in 1948 and the site was in continious use up to 1961. I know this as my parents were living there when I was born in 1951 and my mother (who is now in her 90’s) can remember living there, The nissen hut development was nicknamed Tintown. Also there was no mention that I saw anywhere about the prototype Vickers Valliant bomber that crashed in the field just beside the huts in January 1952, Unfortunately there was a fatality in this incident, I think it was the co-pilot. I know all this was after the war but, as rationing didnt finish until the early 1950s, could it not be that the country was still under war restriction till then, Should not the history of Holmsley Airfield and its associated buildings include this important information about immediate post war use? It would also add to the interest for those visting the Museum. People would be under the impression from your displays that, after 1946, the airfield and its buildings disappeared, which is not the case and I feel your display should somehow reflect that.social history as well as its distinguished war history. Thank you for your interesting comment about your personal history. I understand that, during your visit to our Museum, one of our Trustees gave you contact details for the New Milton History Society, who may have further information to assist you. 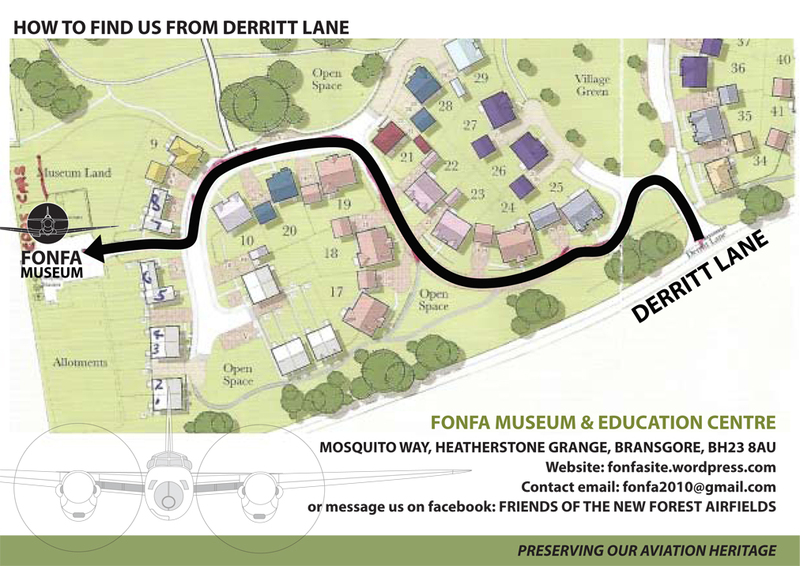 The Friends of the New Forest Airfields (FONFA) is an Educational Heritage Charity dedicated to the memory of those airmen and women, who served on the RAF and USAF airfields in the New Forest area during the two World Wars, primarily in WWII, and whom our Memorial at the western edge of the WWII Holmsley South airfield commemorates. The new FONFA Museum, which opened in 2016, contains many artefacts, pilots’ stories and uniforms, models, dioramas and prints depicting the heroic deeds of those who served with dedication and selfless courage, to defend our freedoms, which generations have enjoyed since the end of WWII. Many of the items contained therein are unique. Although we have extensive information on the history and usage of the various airfield sites, through from the 1910s to the present day, much of that information, while undoubtedly of personal interest to some, is not directly relevant to the aims of the Museum or of our Charity. While we can supply references for the post-war use of the airfields, the Museum is not large enough to display all of this information, at the same time as telling the stories of the brave fliers who once protected our freedom, which is its primary purpose. However, our Trustees and Volunteers are always willing to discuss such matters, if asked, with Museum visitors. Detailed information on post-war Local Council emergency housing activities and more recent Camping and Caravanning usage can be found elsewhere, as can a glossary of post war aircraft crashes in Hampshire. .
You clearly have an interesting personal and family connection with the Holmsley site and, if you would like to put together a professional display of photographs, recollections, memorabilia, press reports etc. about the post war housing use of the site, the Trustees would be pleased to consider offering you space for a temporary exhibition of such items in the Museum, or on the website, in the future.